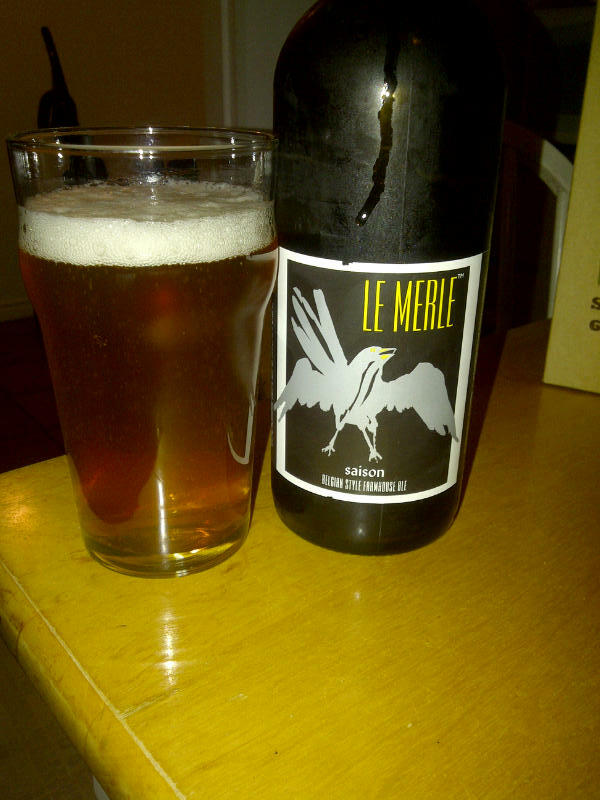 From Fort Bragg California’s North Coast Brewing Company comes their “Le Merle Saison” a Belgian Style Farmhouse Ale. This Saison pours a golden lager yellow with a white head. The aroma consists of yeast, citrus, wheat and pepper. The flavour is of a Belgian style yeast, lots of pepper, citrus, tropical fruit and some hops to finish things off. The alcohol content of this beer is 7.9% and an IBU of 26. This is a great Saison that you should head out and pick up right away. Commercial Description: Le Merle is a rustic ale, pale in color, inspired by the rich brewing traditions of the Flanders region. Abundant hops and a Belgian yeast strain contribute exotic aromas of tropical fruit. This entry was posted in Saison and tagged belgian style, belgian yeast, bitterness, california, citrus, farmhouse ale, fort bragg, hops, hopy, north coast brewing company, pepper, saison, tropical fruit, usa, yeast.